Which Apps Are Eating Your Battery? Normal Will Tell You. Somewhere, somehow, maybe less than a year after I got the latest version of my iPhone, its battery would mysteriously deplete in about half a day. I wasn’t really sure why. But now I can find out. There’s a new app called ‘Normal’ out from a pair of Stanford Ph.Ds in computer science named Adam Oliner and Jacob Leverich, who are turning some postdoctoral research into a company called Kuro Labs. Their first project, Normal, is a battery diagnosis service that tracks and compares your app usage to other iOS device owners to see if there are any specific actions you can take to save battery life. The 99 cent app compares your phone’s battery usage over time with other people who have similar combinations of apps. Hence, the name ‘Normal’ — is your phone’s battery life normal compared to other devices that are the exact same model? 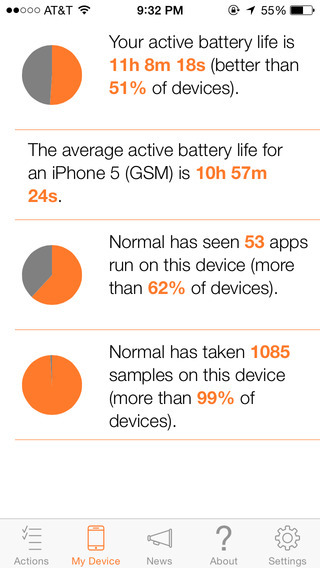 When you go inside Normal, you’ll see active apps, inactive battery hogs and other apps. 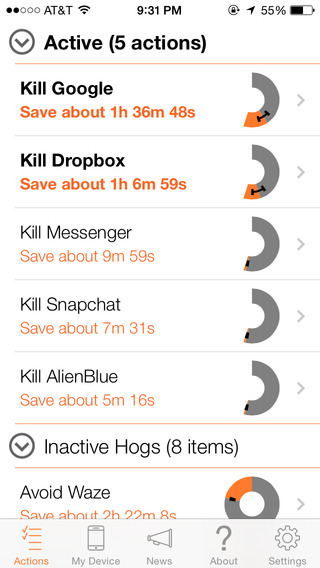 For each app, there is a ring chart that will show you how much battery life you’ll save if you close a specific app. So for instance, if I shut Facebook’s mobile app off, Normal estimates that I’ll save 26 minutes and 47 seconds of battery life. Or if I close inactive apps running in the background like Instagram, I’ll save an hour and seven minutes. Certain apps can be re-configured to use up less battery. Oliner says Pinterest, for example, is not normally a battery hog but there are a few configurations that make it more energy intensive. There’s a screen inside the app that will tell you if a specific app is behaving normally compared to other identical apps on other smartphones. The app is based on a project Oliner led at UC Berkeley that eventually became an app called Carat. The concept seems almost identical. That older app would quietly take measurements from your device, combine that data it with other people’s anonymized usage metrics, and then send back tips on whether to update your OS or kill or restart apps. Now that Oliner is finished with postdoc work, he decided to start a new bootstrapped company with Leverich called Kuro Labs that may spin out more similar concepts. He hinted at looking at laptops or tablets.